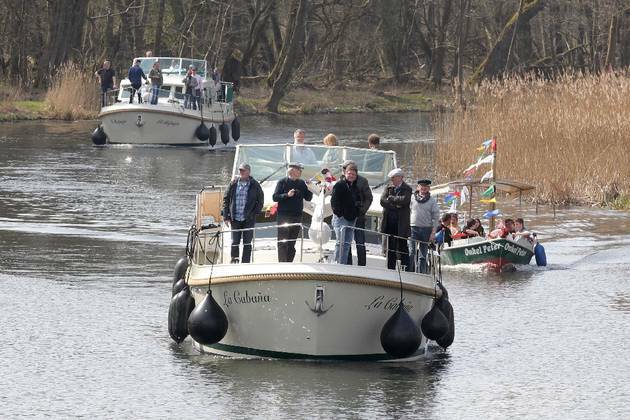 We are unequivocally supporting the efforts by the association Unser Finowkanal to secure the future of this important heritage waterway, bypassed by the modern Havel-Oder Waterway. 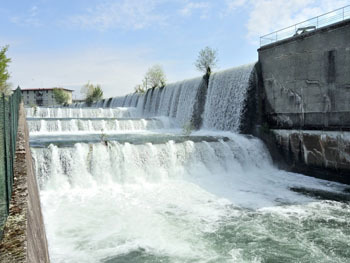 The Federal Government has declared its intention to close the canal for navigation, convert the locks into weirs and maintain the channel exclusively for drainage. The only way to avoid this scenario is to secure funding for the considerable investment of €75 million, to cover all costs, particularly to restore the locks. To date, all the locks have been operated each season, using unemployed from the local job centre (and two voluntary lock-keepers), but some repairs have become too urgent, and there is at present no authority nor any funding in place to implement them. 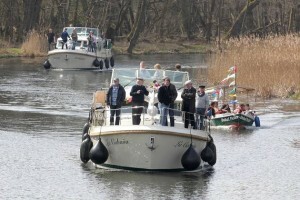 A boat rally celebrates the opening of the Finow Canal for the 2015 season. 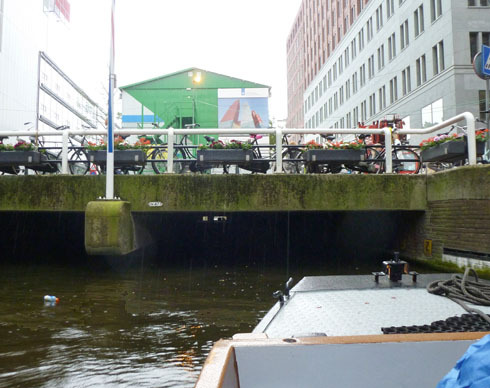 The association Unser Finowkanal continues its campaign for maintenance and regular operation of the canal, which the Federal waterway authority wishes to hand over to the region. If one of the 12 historic locks fails, the canal will no longer be available as a through route, and the direct and indirect economic benefits of waterway tourism will be lost to the Eberswalde/Niederfinow region. The municipalities of the Finowkanal region are under pressure to make a decision by January 2016, for or against their share in the necessary investment, and the issue is being firecely debated. On December 17, the Eberswalde council – with the biggest share in the project – will cast its vote. Only if all the local councils vote in favour of the canal investment will it become feasible to set up a public body to take over operation of the canal. Investors need to be certain that the future of the canal is guaranteed, Under Federal government ownership, there are no opportunities for commercial activities at the locks or along the banks, volunteer lock-keepers are refused, and the risk of failure of the locks continues to hamper any development. But regional decision-makers are procrastinating, and most of the officials in the Finow Canal regional working group are keeping a low profile, for fear of being held responsible for the failure to take over the canal. Some councils are leaning towards rejection of the takeover because of the lack of evidence of the benefits that tourism could bring to the region, justifying their entrenched resistance to change. Unser Finowkanal president Hartmut Ginnow-Merkert has made a plea for support: if you feel it is important to maintain continuous navigability of the Finow canal, comment here! What does Lille, the historic capital of Flanders, have in common with Milan and Tokyo? Or even with The Hague, featured in this blog a few days ago? 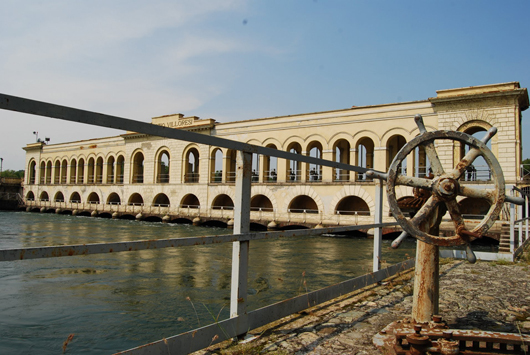 It is a city that is determined to revive its historic intimacy with water, or what our Lombardy friends elegantly describe as la civiltà delle acque, or civilisation centred on water. This means reversing the trend which started in the years after World War II – covering or infilling small canals, or piping underground small streams – justified at the time by two benefits: public hygiene, and more roads for vehicle traffic. 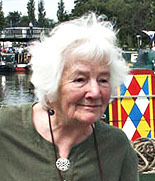 In recent years, Lille’s Mayoress Martine Aubry has seen many reports pointing to the role revitalised canals could play in the city’s development, but the current ambitious plans date roughly from the time the Canal de Roubaix restoration was being completed, in 2009. The EU Blue Links project is a separate story, but it is clear that the remarkable success of that restoration and the Blue Days festivities in September 2009 gave new impetus to the plans being designed by the city of Lille and the Metropolitan District Lille-Métropole. As long ago as 1994, working with Mark Lloyd of EuroWaterways Ltd, I wrote of the benefits of opening up Lille’s old canal arms, and architect Roger Beckett showed in some simple drawings how the canal basin in Lomme could become a vibrant boat harbour and urban centre. 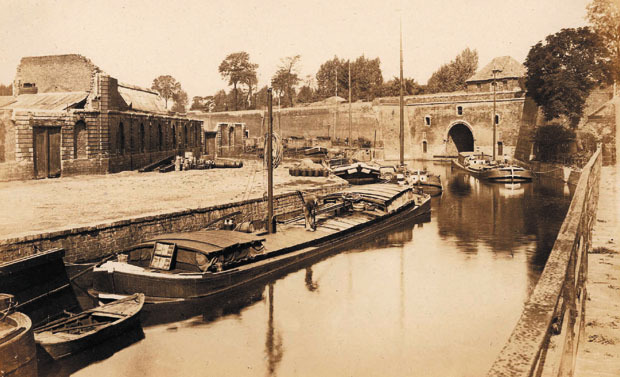 Since then, how many boats have given Lille a wide berth, skirting round the Citadelle on the high-capacity waterway, without realising what they were missing, or simply regretting that nothing had been done to welcome them in the city? Determined to implement the proposals of the successive studies, Mayoress Aubry and her council opted for the most ambitious and costly of the three canal arms, the Vieille Deûle, penetrating into the historic city centre. 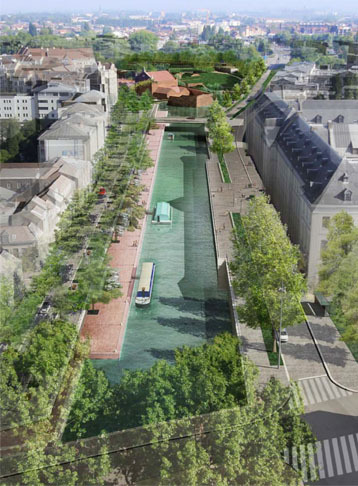 As shown on the map, this involves a new cut to link with the Deûle, part of a local regeneration project called ‘Cœur de Deûle’, and re-excavation of the cut south from the historic Porte d’eau (now a major cross-roads) towards the church of Notre Dame de la Treille. Three design-and-build consortia were selected from six projects, and invited to prepare detailed designs and costings. 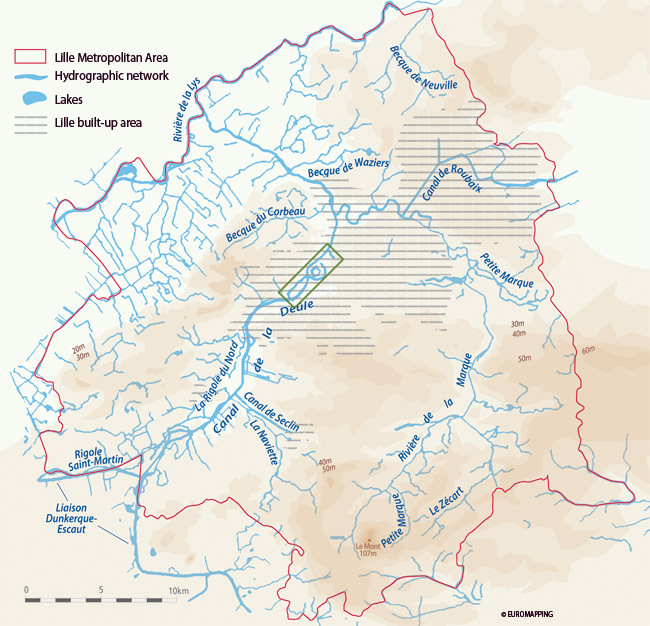 In the meantime, I was in another consultancy group advising Lille on an overall master plan for water in the city. I observed that it was unfortunate to spend €40 million on this branch, however spectacular for the city centre, while not treating the other arms, where it seemed more value could be derived from smaller investments. In essence, the counter-proposal was to restore the link between the Moyenne Deûle south of the Citadelle and the modern waterway downstream of the Grand Carré Lock, also developing a boat harbour with all services in the canal basin at Lomme. But the issue of priorities was not the only reservation to be expressed. Councillors faced unexpected opposition to the project at public meetings. 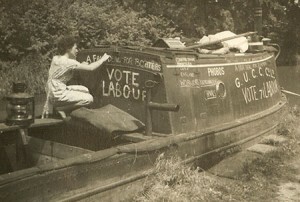 Local inhabitants were concerned about car parking, the risk of flooding their cellars (unrelated to the project, but it is hard to overcome prejudices and perceptions); there was also scepticism about the usefulness of the canal arm. Finally, Lille politics clouded the issue. 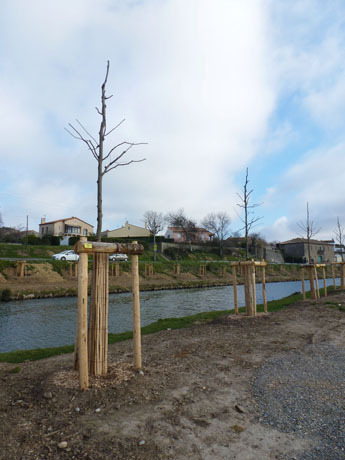 Outlying communes in the metropolitan district felt that the investment was going to benefit the central commune of Lille, and should be balanced by other investments to boost waterway tourism throughout the network. This is the purpose of the Plan Bleu for Lille Métropole, in which I have also been involved, with landscape architect Alfred Peter. To cut a long story short, the Vieille Deûle project through to the Avenue du Peuple Belge has been put on hold, while the overall strategy of the Plan Bleu is defined and eventually approved by elected representatives throughout the metropolitan area, from the Belgian border and the pastoral landscapes of the Lys valley in the north to the former coal mining belt in the south. This means that boaters will also have to wait for a few more years, while these plans mature and are implemented, hopefully with less political wrangling and a clearer understanding of how all these canal projects are in the common interest of the population and tourists throughout the region. 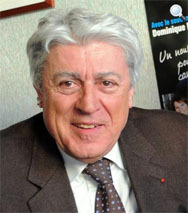 Once this understanding has been reached, and the Plan Bleu approved, the Vieille Deûle project will be back on the agenda, and should hopefully be completed in the medium term. 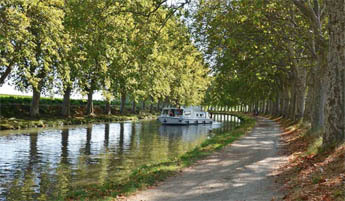 In the meantime, the old route round the Citadelle, via La Barre lock, should be back on the map! This will complement another major tourism and heritage project in the open space between Vauban’s fort and the city centre. 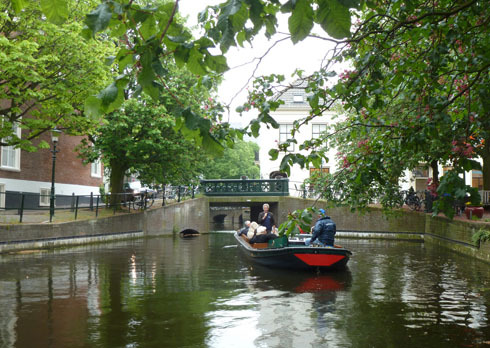 ‘Small is beautiful’ could be a motto for canals, especially in cities. And this simple precept is now being followed in the Netherlands with spectacular results. This was the main lesson learned during the EU Waterways Forward partnership meeting in The Hague on May 30th-June 1st. During the first day of proceedings, May 31st, delegates discovered the ambitious canal restoration plans of South Holland and the association of local authorities RegioWater. The above extract from their planning map shows the remarkable density of ‘water routes’ which could potentially be opened up to navigation in boats of the appropriate dimensions. The green lines are all routes not normally available to recreational boats, while the crosses mark specific obstacles to be lifted, usually very low fixed bridges. 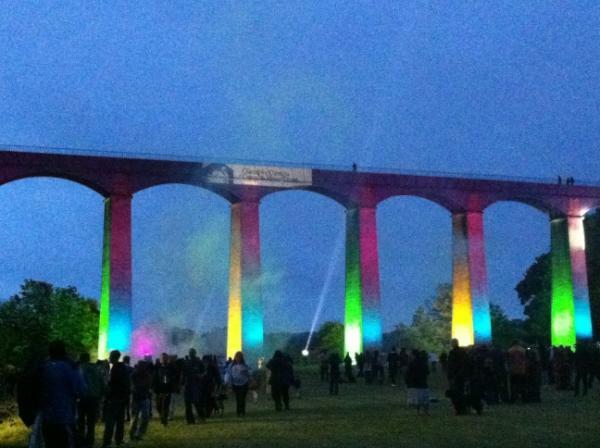 The one furthest to the west, the Moerbrug, is said to be too low even for swans to pass under! A vivid demonstration of the issues – and the potential – was provided in the afternoon, as the 25-strong delegation (with members from the UK, Ireland, France, Italy, Poland, Hungary, Latvia, Norway and Serbia, as well as the host country) embarked on two open trip-boats run by the association Ooievaart, to discover the ring of canals (green on the map, beside the name Den Haag). Despite rain of similar intensity to that experienced by the million visitors at the Thames Pageant for the Queen’s Diamond Jubilee three days later, the 90-minute trip was both entertaining and instructive, as the history of the capital was explained street by street, bridge after bridge. Entertainment came from the numerous covered sections of the canals, where we all had to bend over completely to squeeze under beams, pipes and other protruding parts. It was like being in a surgeon’s probe, exploring the entrails of The Hague. And lo and behold! 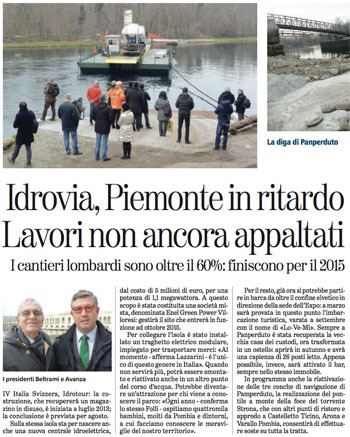 Structures were already in place to start implementing the RegioWater plan by removing the canal’s cover, to expose it and restore it to its rightful place in the urban environment. As in Lille and in Leipzig, the argument for covering the canals (or infilling them completely) was salubrity, in the absence of proper sewerage systems. With proper sewerage, water quality is now very good. The idea, as the IWI tour discovered in Leipzig in April 2011, is to use the opportunity of maintenance or replacement works to raise the bridges and increase the available headroom. 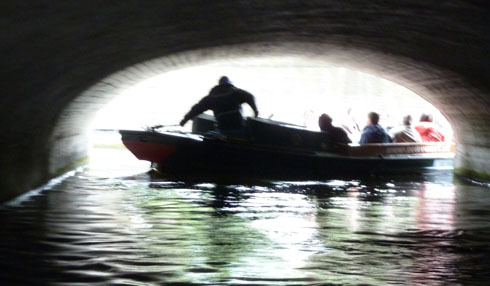 This means that navigability in larger craft can only be a long-term objective, but the process is to be hailed, as well as the opportunities for exploring such canals in small craft. Forty years after I was blocked in a hireboat on the canal route south from Groningen to Coevorden, which had just been closed, the phase of economic development which led to the abandonment of so many small canals has clearly come to an end. ‘Small canals’ are now being revived on a significant scale, in both town and country.